Pilgrims on the sidewalk opposite to the mosque of as-Sayyida Zaynab, granddaughter of the Prophet Muhammad, in Cairo during the mawlid in her honour. Many people travel over long distances to celebrate a mawlid, and may stay up to a week. Some stay in rented apartments but most people put up tents or simple carpets on the sidewalks and backyards. 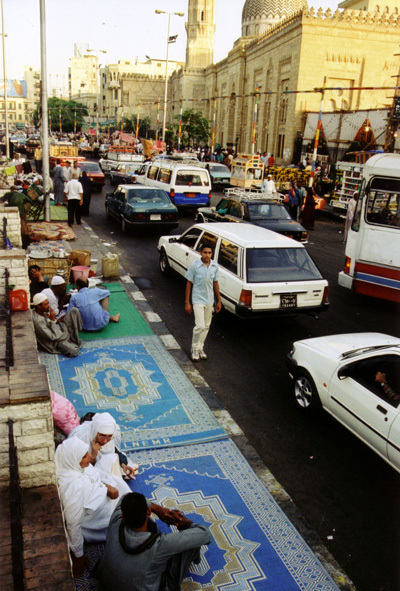 The crowds of pilgrims dramatically change the face of the city as the sidewalks become filled by tents and carpets. The city-dwellers often find it strange how come people are prepared to live under such Spartan conditions. But for the pilgrims the hardship of sleeping in a tent is often of voluntary nature: even people who live nearby may choose to sleep in a tent during the mawlid for the sake of the spiritual and festive experience. Some city-dwellers find the pilgrimage to their home district not only strange but outright wrong: they feel that the pilgrims spoil the image of the city and should not leave their home and work behind to celebrate. The pilgrims see it differently, of course. After all, they point out, the people who criticise them also may leave their home and work to go for a holiday on the beach, and going to a religious celebration certainly is more praiseworthy than a vacation on the beach.